Join the Tanah Lot Sunset Tour and watch a spectacular sunset at Tanah Lot, Bali's most iconic temple perched dramatically on a rocky outcrop in the sea. Marvel at the Royal temple complex and gardens of Pura Taman Ayun. Enjoy the lush gardens and see the serenity of this water temple. Don't forget to bring your camera or power bank as this is one of the best photography opportunity while you're in Bali. See playful monkeys in the Kedaton Monkey Forest swinging from the treetops to approach you during this half day temple tour. 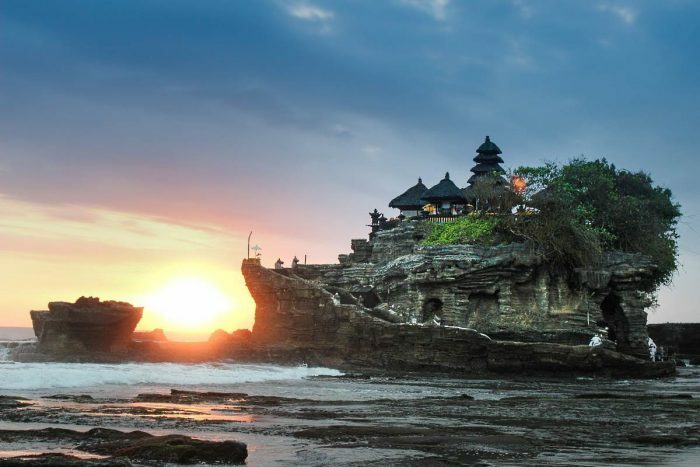 Enjoy this Tanah Lot Sunset Tour at discounted price, and with easy return transfer to your Bali hotel. Want more? Don't forget to join the Uluwatu Kecak tour too to complete your cultural experience of Bali. Have a question about the Tanah Lot Sunset Tour? Check the tour info below for more background information about the attraction. In this Tanah Lot sunset tour, you'll be visiting two of the most stunning temples in Bali -- the Taman Ayun and the Tanah Lot, with return transfer to your hotel room. Tanah Lot is a Hindu temple 1 hour ( 22km ) away from Kuta or 1 hour and a half from Ubud (33 km away). Meaning the "Land in the Sea" in the Balinese language, the Tanah Lot Sea Temple is one of Bali's 6 key temples, believed to protect the island from evil spirit. The temple (or Pura) is also Bali's most picturesque, a photographic icon and is in the bucket list of most first time travellers to the island. Locals believed that venomous sea snakes and a giant snake live in the base of the rocky island, to guard the temple from evil spirits and intruders. A third of Tanah Lot's rock is actually man-made artificial rocks, created using a Japanese government fund. During this tour, you'll arrive in the Tanah Lot before sunset, which is around 5:30 pm. You'll stay here until the end of your trip (around 8 pm) before a return transfer to your hotel. Pura Taman Ayun Temple is a Hindu royal temple 1 hour ( 25km ) north of Kuta. Means beautiful garden in Balinese language, the Taman Ayun temple is opened daily and has better facilities for travellers. This Balinese temple was built in the 1634 by the then ruler of the Mengwi kingdom and is famous for its Chinese architectural inspirations, garden with water features. The temple was once only accessible for the royals in the 17th century. This is your first pit stop during your Tanah Lot sunset tour.